A documentary that chronicles the life and career of legendary basketball player, Sam Schoenfeld. "Play It Again Sam" Compelling Film? 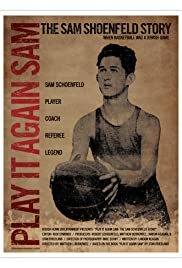 As a former college basketball player in the 1950s I was very interested to see a film about Sam Schoenfeld. His story was one that was very familiar to anyone that grew up in the boroughs, attended college, was Jewish and especially alive in the wake of the CCNY scandal. I came across this film after doing a search while assisting a student in his doctoral thesis. I was beyond disappointed by it. I was amazed at how verbose it was. While the footage was obviously very deep and well researched, it was poorly placed throughout the film. The narrator had a grating voice, and upon further inspection, discovered that he was also the director. Titles of colleges were misspelled in the graphics. Poor grammar was used in the narration. The extreme narcissism of the film includes a "making of" compendium where the director tells his story of making the film (yawn). Upon further inspection we discovered that this same director is even producing a documentary - ABOUT HIMSELF. It would be great to see this same film re-scripted and re-edited so that the story was one that would be a sweet slice of life period-piece about New York.